One of the many great things about my position as a fabric rep is reconnecting with old friends. 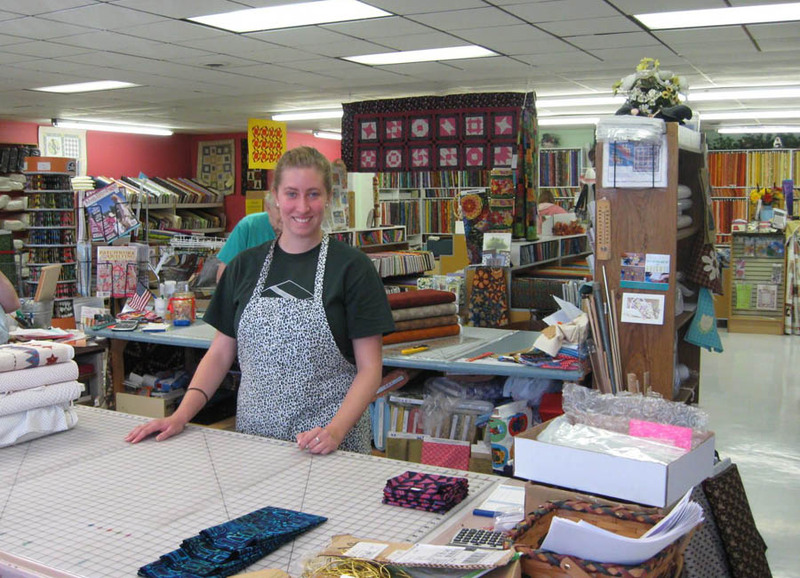 One of them is Vivian Ann Wright, the owner of Mammaw's Thimble. Vivian and I go back to the days  when she had her shop in the basement of her home in Knoxville. Now, she is in her third (even bigger and better) commercial location at 4319 Papermill Drive. Mammaw's Thimble, 4319 Papermill Drive in Knoxville, TN. 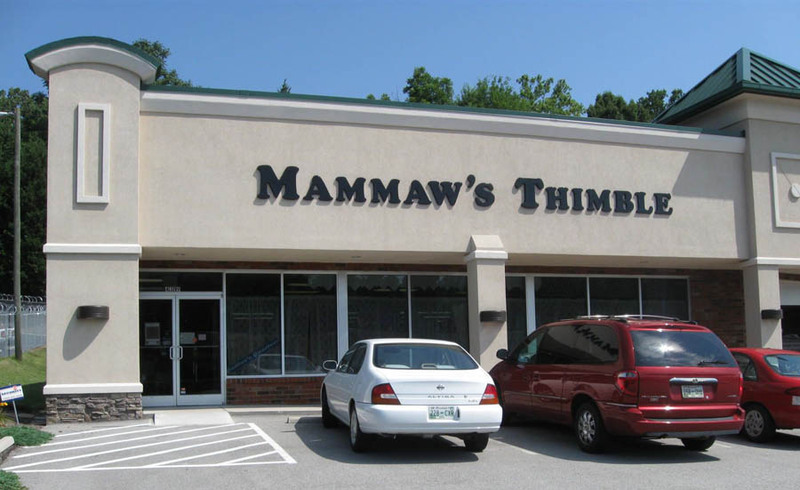 Mammaw's Thimble moved into this newly renovated location (just up the street from the previous "Sweet [Suite] 16" storefront) this year. The renovations include an archway and ramp from the main part of the store to rooms devoted to reproductions, 20s and 30s prints and a great classroom with lots of natural light. The grand re-opening to celebrate the new location was held this June. 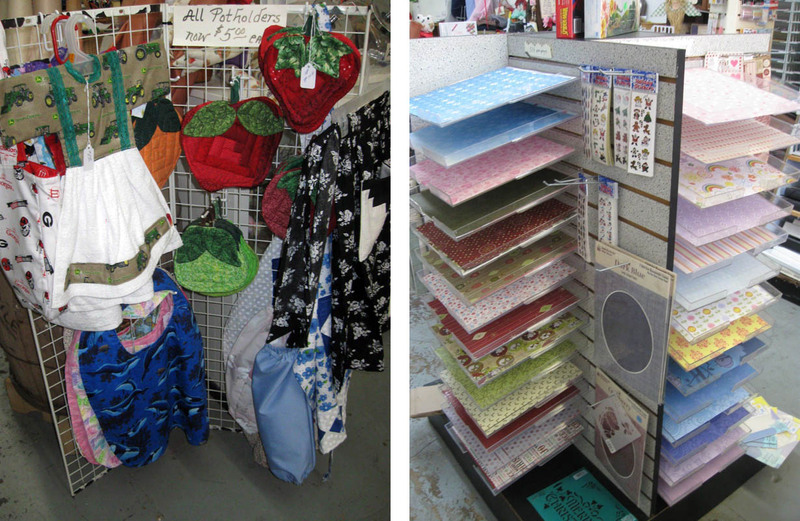 The check-out and cutting table at Mammaw's Thimble. Among the 8000+ bolts of fabrics and the glorious 30k selection of Fat Quarters, are threads, kits, patterns, books and even "quilty" things for the quilter and non-quilter such as these greeting cards. 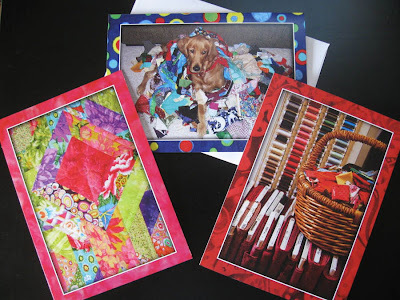 Some of the fabric prints on the borders of these cards are from actual fabric collections. It was great to see Vivian again and I was so happy and proud for her that her business is doing well in her new location. She was one of my cheerleaders when I won Best of Show at the 10th annual "A Mountain Quiltfest" in 2004. Upon hearing the announcement of my winning, she ran (hiking up her long calico civil war reproduction skirt above her knees) from her booth at the show into the exhibit hall to congratulate me. She is a great friend and we share in each other's successes. "The Chef's Dilemma" 2004 Best of Show, A Mountain Quiltfest. 2005 Smoky Mt. 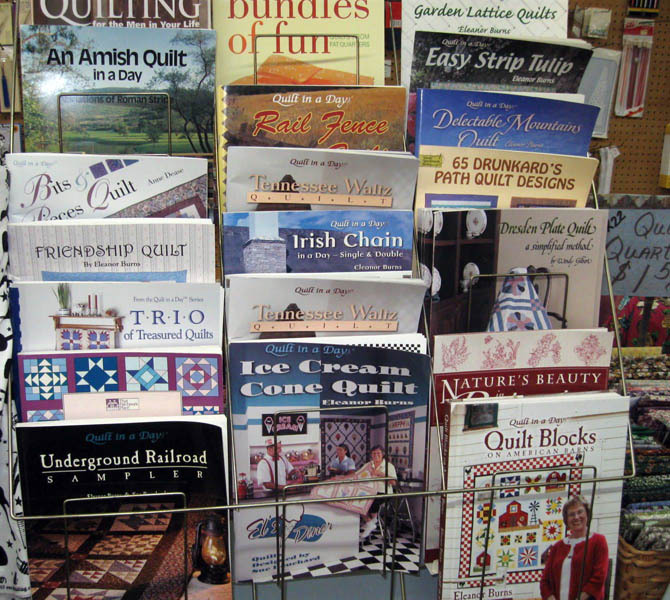 /Dogwoods Art Festival; juried into Quilts For Change, 2006 Zonta exhibit. 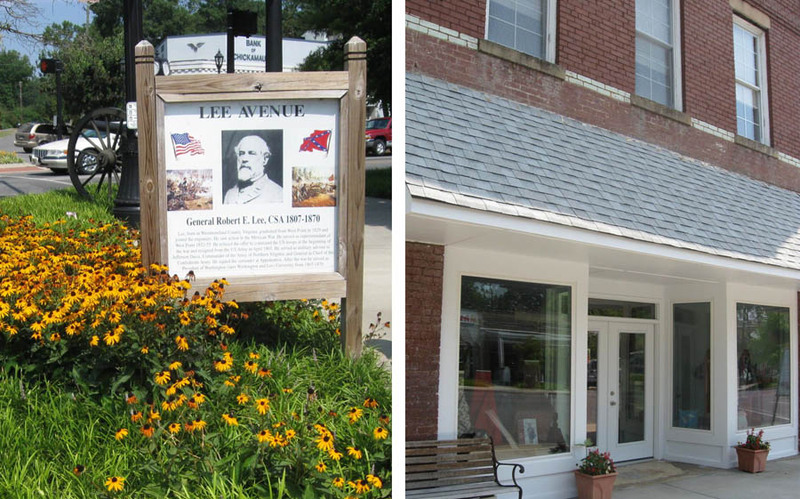 Going south from Chattanooga to the historic downtown of Chickamauga, Georgia, is Memories and More. 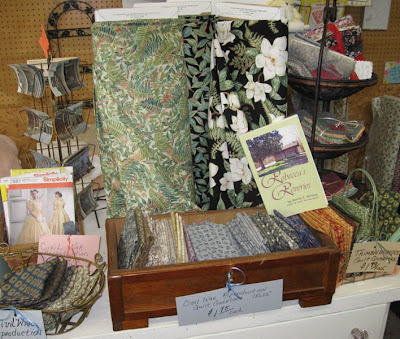 This little shop offers a bit of everything, as their tagline says, "fabric and frills to create a memory." Memories and More is near the corner of Lee and Gordon. Due to a newly remodeled store front, the sign has not been installed yet. 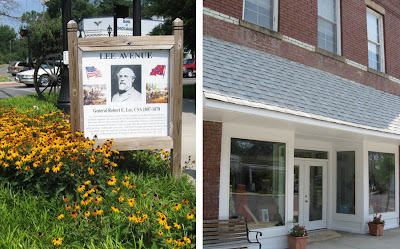 So, if you see the sign with a photo of General Lee, the shop is the second door from this corner at 121 Gordon Street. Eleanor Burns books are popular at the shop. A previous BOM (Block of the Month) program was from her Underground Railroad book. Vicki, one of the staff, is the sewing and quilting instructor and is planning a beginning quilting class in August. Pam, the owner, offers alteration services at the store as well as some vintage sewing patterns, scrapbooking papers and consignment items. 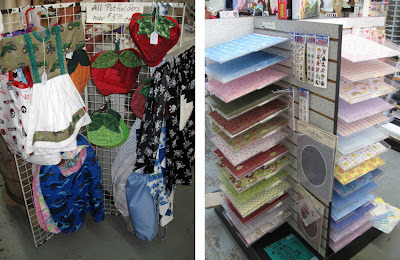 Cconsignment items (left) and scrapbook papers (right). 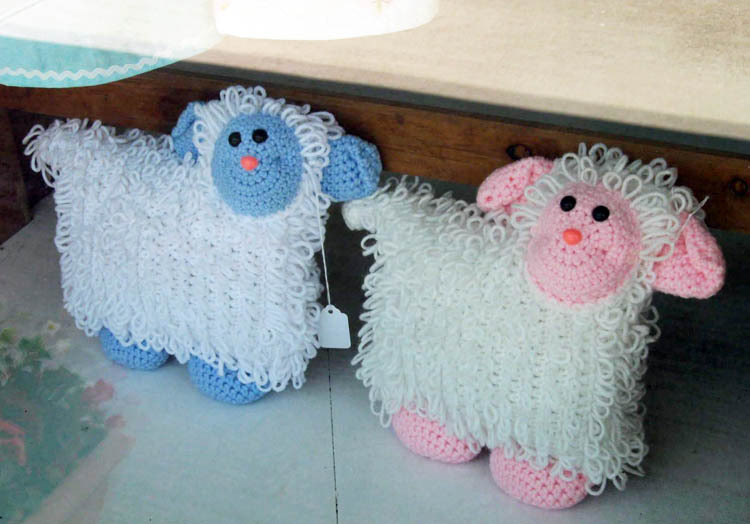 These little crocheted sheep greet you from the front window. 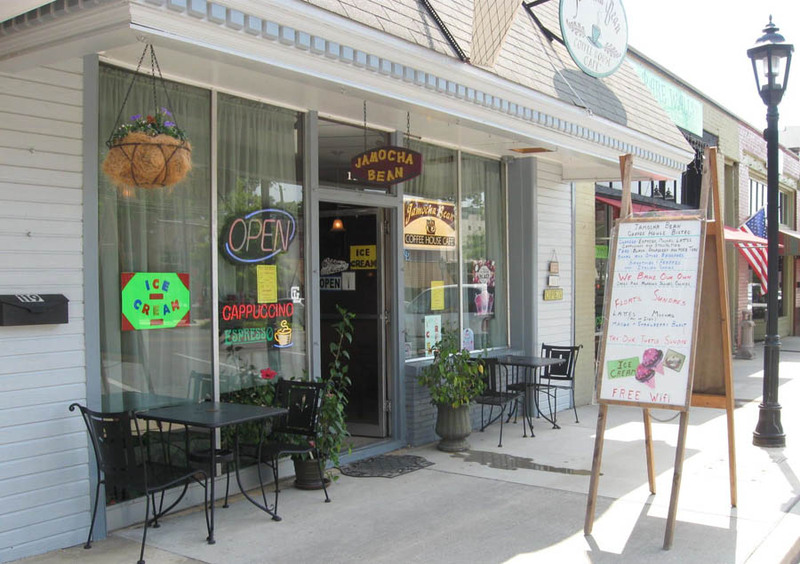 On the 100-degree day that I stopped by, the Jamocha Bean Coffee House (right next door at 119 Gordon St.) was a welcome oasis. Betty, the proprietor, offers an extensive menu of hot and cold coffees, lattes, cappuccinos, steamers, pastries, bottled juices, floats, ice cream and sundaes. The free Wi-Fi was also a very convenient service. Jamocha Bean Coffee House at 119 Gordon Street.